In 2017, Progressive candidate Jonathan Wallace raised $41,593 compared to his strongest conservative opponent’s $59,326. Republican incumbent Chuck Williams resigned the seat when he was appointed director of the Georgia Forestry Commission in August 2017. Progressive Jonathan Wallace defeated three conservative challengers in the November 2017 special election by a margin of 13.4 percent. Hillary Clinton carried this previously reliably conservative district by 7.2 percent. 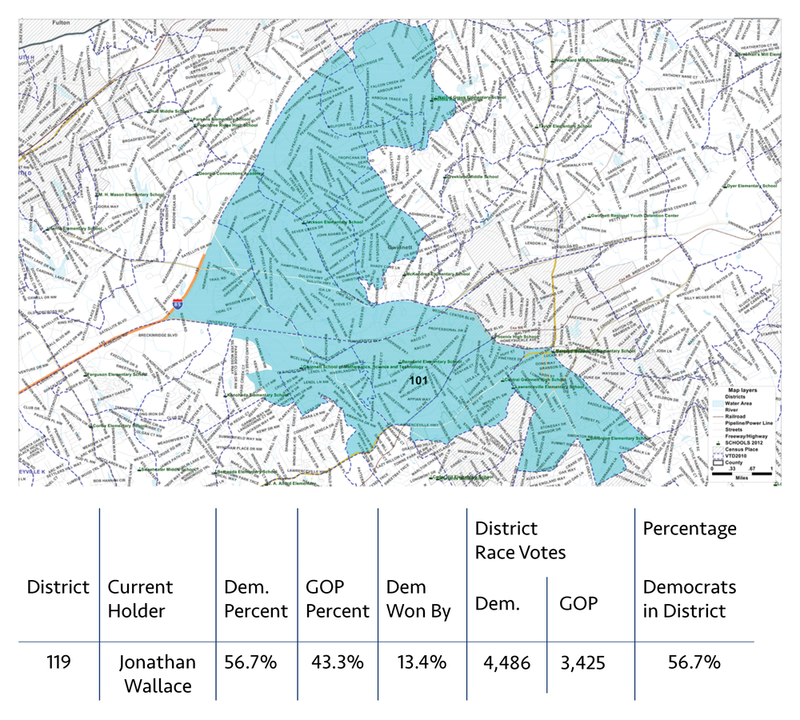 Wallace had three conservative opponents in the special election, but beat them with 57 percent of the vote. However, voter turnout was low (7,911 total votes). To protect this seat, progressive Get Out the Vote efforts will be key. All three conservatives ran on conservative platforms of supporting Donald Trump, guns on campus, restricting transgender bathroom use, and no Medicaid expansion. Jonathan Wallace (D), an entrepreneur who works in the technology sector, ran on ending campus carry, expanding Medicaid, anti-gerrymandering, pro-livable wage and LGBT rights. He also campaigned for public schools and for lower auto insurance rates. Marcus Wiedower (R) is a contractor. He and Strickland both ran against Wallace in the special election for 2017. He’s the second vice chair of the Oconee Republican Party and was appointed director of the Georgia Forestry Divison. He’s campaigning on education, transportation and no new taxes.